Les 7 doigts de la main, founded in Montreal in 2002 translates as “the seven fingers of the hand”, and refer not just to the dexterity of the artists of this vibrant company, but also, its seven founders. The company’s fourth show PSY is a rollicking, never a dull moment experience whose performers literally defy gravity and sustain high levels of entertainment and enjoyment throughout. Its’ imaginative premise centres around neuroses we all recognise and/or share to a certain extent, but don’t often admit to: insomnia, paranoia, agoraphobia, hypochondria, addiction, obsessive compulsive disorder and intermittent explosive disorder to name a few. Technically, PSY pick up where the company’s other shows left off as it also features its’ own engaging and original mix of acrobatics, avant-garde dance, physical comedy, virtual projections, music and spoken word and other elements, and it does so in a way that is hugely entertaining. PSY’s theme, the human psyche offers its’ performers a veritable goldmine of comic possibilities to draw on and there’s little territory they don’t touch on here to the amusement of their audience. Michel (Guillaume Biron) hears voices and is ordered to climb on to a trapeze and hang by his toes, which he incredibly does, and Lily, an agoraphobic woman (Danica Gagnon-Plamondon) in an attempt to cure her malady, swings through the air, nearly going through the roof. 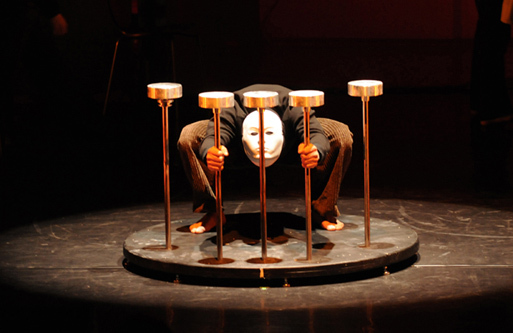 Both performers excel in their arts, as does Jacques the Hypochondriac aka Nael Jammal in the context of a man searching for his identity amid a sea of blank masked faces, who stands on his hands to get a better view of things. But everyone in this company is a master of not just one, but many circus arts. For example, Olga Kosova as Suzi, an Intermittent Explosive Disorder sufferer lashes out on her aerial rope and knife juggling and throwing (thankfully not simultaneously) as you’ve never seen before. Similarly, Gisele Henriet, appropriately, the show’s Multiple Personality Disorder case, not only excels at hand-balancing and group juggling but literally, tops the house via his teeterboard. Enthralling, potentially dangerous moments enacted by Heloise Bourgeios as Clare the Insomniac and William Underwood as George (the Paranoiac) interacted on a Chinese Pole, were nothing short of incredible for their great control and imaginative balancing manoeuvres. Julian Silliau (Johnny the Addict) utilizes his German wheel in ways which are far from cliché, mesmerising the audience. Silliau also participates in group hand-balancing and juggling, both of which are excellently performed by all. Florent LeStage, juggler extraordinaire, makes the impossible seem easy, even when he’s juggling a bunch of wands and, a wooden cane. Then there are Mohammad Bouseta’s (Danny the Maniac) impressive hand to hand and fly mat abilities, and Tom Proneur-Orsini’s (Smith/Mr. OCD) similarly incredible hand to hand, hand balancing abilities and group juggling. But that’s the beauty of this troupe – nothing is missed out on in their versatile circus performances. If you look, it’s all there – clowning, strong men (and women), juggling, acrobatics, trapeze, balancing, you name it. There is absolutely nothing missing in this show, apart from perhaps, atypical magic tricks, though the magic The 7 Fingers collectively present here is far more beguiling. The layers of ‘characters’ (or should I say ‘cases’?) circumstances are enhanced through the use of simplistic, often surreal, cartoonish projections depicting the swinging pendulum of a clock on the wall, floating birthday party streamers, changing light through the windows of a flat, childishly abstract grey and black rolling cityscape and other scenarios and accoutrements as we move through scenarios, signifying the passage of time and locales, i.e. a psychiatrist’s waiting room, busy street, etc., with accompanying soundscapes, created by Julien Lenthier, over shifting music which allows for the necessary collective projecting enabling us to mentally, complete the pictures. A whole team of talented creatives are responsible for the charming virtual input of this show. Music is an important factor in PSY, as it sets the mood for each piece, though it’s always subject to change, as it tends to shape shift along with performances and scenarios, so it is a veritable kaleidoscope of styles, among them funk, hip-hop, industrial rap, with urban, nightclub, street and party soundscapes. 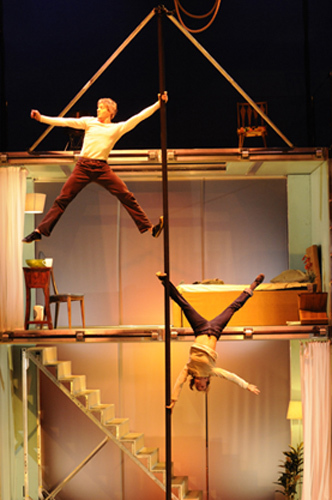 The deceptively simplistic looking set, ingeniously designed by David Barnabe with Cloe Alain- Gendreau, allows for maximum possibilities and usage as it opens to a two floored city flat and enables a multitude of acrobatic possibilities such as balancing on its’ staircase, which can be moved around the stage as needed. Call me a kid, but there are few things I enjoy more than a good circus. Perhaps my appreciation of its often canny mix of the unexpected and derring do is down to the fact that I was raised on an annual diet of sawdust and spangles from the time I could walk. So for me, spring meant not Easter, but ‘the circus is in town’, and I mean bona fide ‘big top’, i.e. resourceful, non commercial type circus. Having laughed, oohed and aahed along with the rapt audience throughout the course of this fast paced, amazingly orchestrated, dazzlingly executed show, and jumped to my feet when the rest of the audience did, en masse at the end, I can only add one thing. I challenge you to find a better night out.